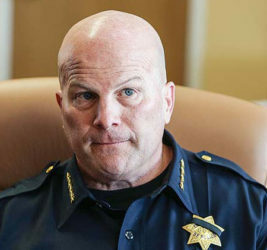 SAN FRANCISCO, (Reuters) – San Francisco’s police chief, Greg Suhr, resigned under pressure from the city’s mayor yesterday, just hours after an officer’s fatal shooting a black woman sparked new outrage in a city whose storybook beauty has been overshadowed recently by high-profile police killings. The police department and Suhr have faced mounting criticism and protests for months in the wake of some police killings and a scandal over racist text messages sent by police officers. San Francisco Police spokeswoman Officer Grace Gatpandan said she could not comment on Suhr’s resignation and said the mayor’s statement was all the office could provide. Lee named Toney Chaplin, a deputy chief of police and head of the professional standards and principled policing bureau at the department, as acting police chief. Chaplin is African-American. Hours earlier, Suhr told reporters that around 9:45 a.m. two officers approached a 27-year-old woman as she sat in a car that had been reported as stolen. Suhr said he did not know whether the woman was armed. The woman tried to drive off, crashing into another vehicle fewer than 100 feet away. She was shot by one of the officers, a sergeant, after refusing to comply with their orders, Suhr said. She later died at an area hospital. Suhr said the officers had not been interviewed. The two officers and the woman have not been identified. The use of lethal force by U.S. police, against African-Americans and other minorities, has been the focus of nationwide protests since mid-2014. Thursday’s shooting occurred in San Francisco’s Bayview neighborhood, where in December police fatally shot a black man who was a suspect in a stabbing. Police said then that 26-year-old Mario Woods, whose family has sued the city, was holding a knife and refused to drop it. Bystander video of that shooting, which went viral after being published online, showed Woods being gunned down in a hail of bullets by officers. 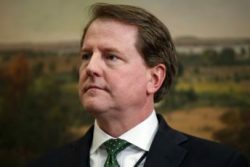 Following that shooting and amid escalating protests, the city and the U.S. Department of Justice launched a collaborative review of the police department in February, which critics said fell short of a civil rights investigation.